The Flow of History is a history education network for Vermont and New Hampshire communities along the Connecticut River Watershed. 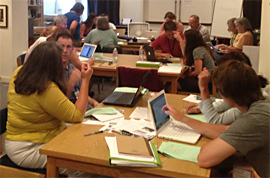 Now in its 12th year, Flow of History has been offering professional development to teachers through study groups, book discussions, primary source workshops, and summer institutes. Since 2001, we have provided programming each year to over 50 teachers from Vermont and New Hampshire districts including, including Dresden/SAU70, Claremont Unified School District/SAU6, Windham Southeast Supervisory Union, and the Barre Supervisory Union. Flow of History’s mission is to deepen engagement in the natural and cultural history of the Connecticut River watershed in Vermont and New Hampshire through educator professional development and community-based educational activities. Flow of History offers the following programs and tailors programs to both the pedagogical and content needs of the group. Being a participant in Flow of History book group has meant that I am not reading in isolation with my own closed ideas. The Primary Source Workshops opened my eyes to activities to use in the classroom to enhance students’ critical thinking skills. A highlight was the modeling of lessons using primary documents. Working with place-based materials has the potential for tremendous changes in the way I teach and the way kids experience history.